As the Hungry Ghosts Festival is about to begin, I found it a good occasion to share a few ghosts stories with you. The first one is related to the Japanese occupation of Hong Kong of sad memory. In December 1943, a shinto shrine was erected by the Japanese on top of Mount Cameron to commemorate the fallen heroes of the Empire of the Sun. This defying 130 feet high monument, a kind of equivallent of the cenotaph in Chater Square, could be seen from every single location in Victoria Harbour. The most important part of it, however, was invisible to the eye, buried 46 feet deep under the shrine. 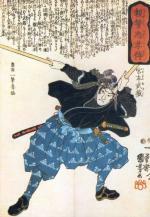 To give a sacred status to the monument, the Japanese had indeed brought from Tokyo a 500 years old sword. This priceless sword was said to belong to Miyamoto Musashi (1584-1645, nearby), probably the most famous samurai ever, who wrote a strategy treaty called "The Book of the Five Rings" telling about the art of sword fight as well as philosphy of the warrior. So before the shrine was erected, the sword was cealed into the thick concrete platform, according to the contractors who built it, in the solemn presence of a sword master. When Hong Kong was eventually liberated, nobody wanted to keep this monument which was a strong reminder of war hardships. However getting rid of it was not that simple as its iron concrete structure was very complex. On 26th February 1947, it was finally smashed down thanks to heavy explosive charges followed by patient hammering of the debris. The platform remained untouched so that when Cameron Mansions was built on it a few years later, there is a chance the soul of the famous samurai would haunt the place. Although antique collectors tried to locate it, the exact location of the sword remains a mystery. Still, inhabitants report some ghost activities in the estate but they would mention a good spirit which knocks at the doors and touch the bottom of ladies whenever possible. The soul of the warrior is probably at peace! 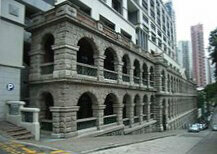 The former mental hospital of Sai Ying Pun is often refered as "High Street haunted house" for a good reason. When it was closed down in the 1970s, two fires started supposedly lighted up by deceased. Some argue that the place was one of the several execution grounds of the Japanese during WWII but as many young people had started to use the old hospital to meet and smoke drugs, those fires may well have been lit accidently. Since then, the building has been refurbished and reopened as a cure center for drug-addicts precisely. Still, if you pass by on your way to a drink to nearby bars, I suggest you walk on the opposite side of the road. One is never too cautious! Generally speaking, there are many locations in Hong Kong that are related to torture, comfort houses ou massacres dating from the Japanese occupation period. Nam Koo Terrace, today closed to public, in Hong Kong Park is one of them, supposedly haunted by the screams of the poor women enslaved by the Japanese there. Then 51 Blue Pool Road Villa was the place of a civilian massacre. If you like hiking, you have probably already walked through some of the many abandonned villages of Hong Kong territory. They are often located in remote areas, in the New Territtories or islands, most of the time founded by migrants from different periods of Hong Kong history. A large number of them have been deserted in the 1990s when overall living standards were raised and the inhabitants found commuting with the city center too complicated. Fan Lau, Sham Chau or Yim Tin Tsai (photo below) for exemple have become mere names of the Country Parks maps, even if the last one, which played the role of early settlement for missionaries, received the UNESCO world heritage label. 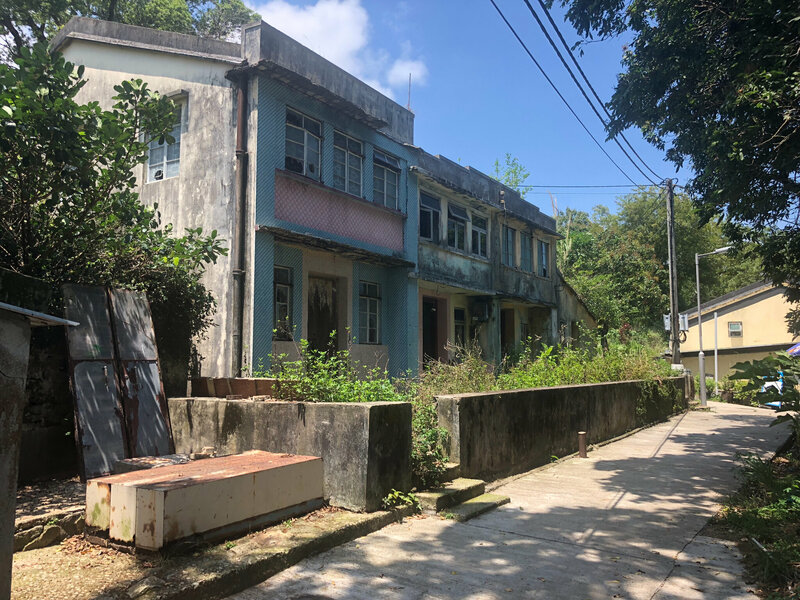 For this reason, tourist cruises in Sai Kung Bay propose a halt in Yim Tin Tsai and it is not unusual to spot large groups of visitors strolling among the abandonned houses during weekends or holidays. When you walk through such places, however, you inevitably think of the young children who used to attend the now deserted community schools or generations of hardworking salt workers struggling to make ends meet. Those strong images will only emphasize the absence of life among the fallen roofs, wild weeds and slashed matresses and provide a perfect playground for ghosts and spirits! As Chinese people are very superstitious, they would make rituals there to avoid bad spirits to haunt abandonned houses. 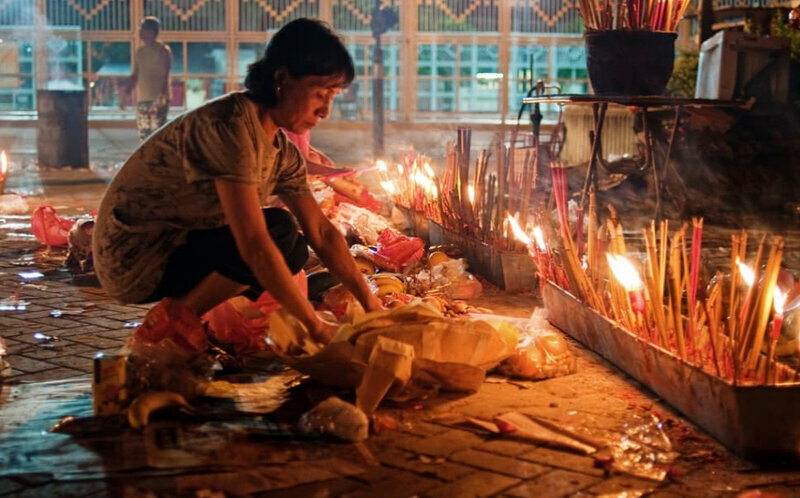 Offerings, joss sticks and octogonal mirrors called "bat gwa" (八卦) can often be found in thoses places. The bat gwa mirrors are hung above doors or windows, bringing good luck and repeling evil. 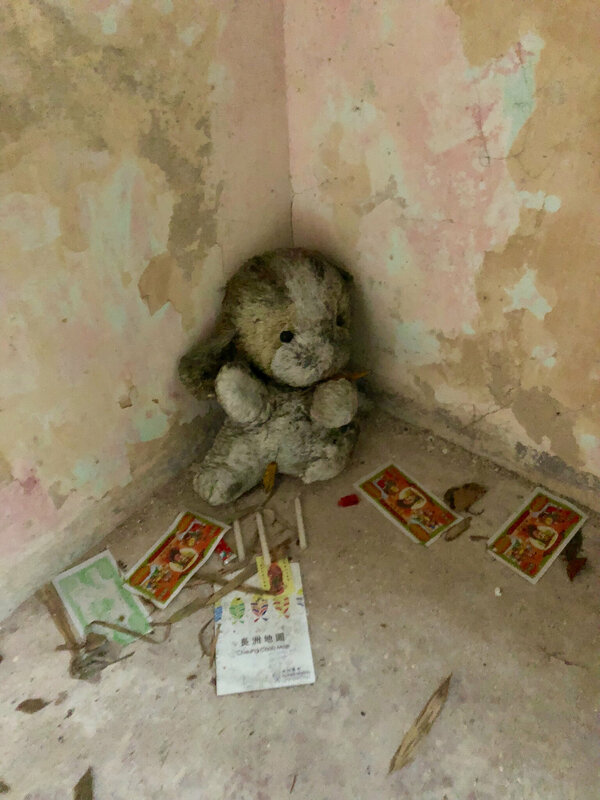 So if you find those vaudoo-like little shrines with cigarettes, alcohol or dolls like in above photo of a villa in Cheung Chau Island, do not be afraid. There is a good chance that this particular house is spirit-free with a perfect feng shui! So don't forget to feed all your ghosts. I wish a happy Hungry Ghosts Festival to everyone of you!